Microsoft overhauled its fading corporate image nearly three years ago with that announcement of a powerful new operating system, Windows 10. 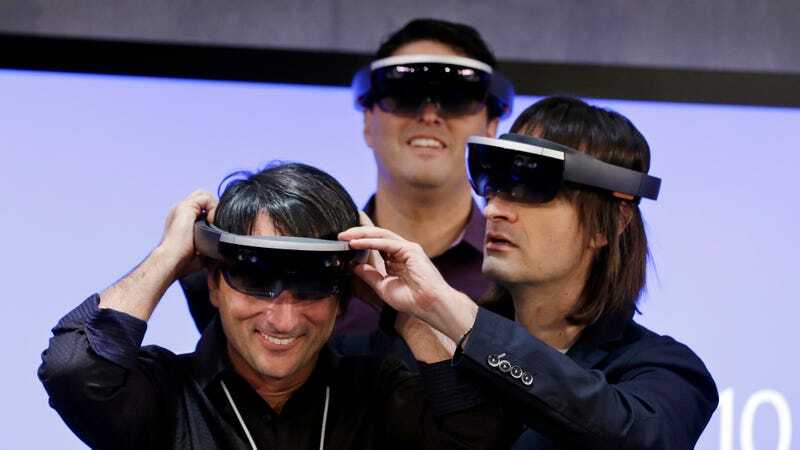 The most surprising facet of this rebranding effort was a promising augmented reality headset, HoloLens, shown off at a press conference in January 2015. When it debuted, HoloLens felt like it could genuinely change the world. The headset was, at the time—and is still to this day—more advanced than budding virtual reality products like the Oculus Rift, because HoloLens includes no wires, is operated by gesture and voice controls, and has the ability to map any room you’re standing in. But the HoloLens really shines in its ability to overlay digital graphics onto the real world, turning any room into a Holodeck. Although the inherent challenges in trying to build a powerful faceputer were apparent from the start, the potential of the technology felt limitless. In the ensuing year, Microsoft continued drumming up more excitement for HoloLens by showing off crazy consumer-oriented concepts in gaming and sports. At an event in June 2015, Microsoft showed how users could essentially play as God in a Minecraft world by using HoloLens. It looked incredible. Four months later, Microsoft showed off a completely insane first-person shooter in which enemy spiders crawled out of the walls to attack users. It was even more nuts than the first demos. Then, one year after the big announcement, Microsoft debuted a concept showing how people might someday watch NFL games using the HoloLens to deliver stats and highlights in holographic images all around the room. The early concepts looked like they were straight out of a sci-fi fever dream—and we loved them. Last week, at its annual Build developer conference, Microsoft essentially reiterated that it has mostly given up on supporting consumer-focused experiences—at least for the time being. When HoloLens chief Alex Kipman spoke at Build’s keynote, this year he failed to mention anything about the forward-looking consumer experience, instead focusing on HoloLens applications in research and education. The rest of Alex Kipman’s presentation was focused on bridging the gap to HoloLens with a new set of cheap virtual reality headsets supported by Windows that are expected to debut during the holiday season. The headsets also run on Windows 10, the same as HoloLens, so the predominant view is that VR experiences will either be ported to or integrated with HoloLens in the longterm. On stage, Mr. Kipman also announced a set of motion controllers intended to work with those new VR headsets. According to a CNET report, the controllers will not work with HoloLens. Microsoft hinted that there would be more surprises about its budding VR platform called “Windows Mixed Reality” at the E3 gaming conference later this year—another strong indication that the company has deprioritized HoloLens experiences for everyday consumers. So what the hell happened to the amazing HoloLens future we were promised? We spoke to a handful of developers to get a sense of why Microsoft seemingly pumped the brakes on its ambitious plans to shake up the gaming and entertainment industries. What we learned was that the price of the HoloLens headset, cost of paying a development team, and complexity of engineering new experiences have been major deciding factors in what developers choose to build. According to HoloLens chief Alex Kipman’s keynote at Build last week, there are more than 22,000 developers who have already created more than 70,000 concepts for HoloLens. But a closer look at the Made For HoloLens store shows that the platform still has a long way to go before becoming mainstream, with only 216 apps available for download at the time this story was published. Those apps include programs Virtually Here, which lets homebuyers preview a hologram of their home before purchasing, or HoloHeart, a holographic heart used for education and classroom settings. Practical VR, a company specializing in HoloLens creation and analysis tools, regularly runs analysis on the HoloLens store and recently told Gizmodo the number of apps has more than doubled since the beginning of this year. The company also said, according to its analysis, a majority of these experiences are enterprise applications. The dream of creating consumer HoloLens experiences has all but gone away, if we’re judging by what developers are creating. Mark Grossnickle of Taqtile, another HoloLens development company, knows all about developing high-quality apps for HoloLens. His company has worked on projects for the Cleveland Cavaliers, Real Madrid, PGA Tour, and other large organizations. He told us, “[Taqtile’s] apps are mainly focused on enterprise, as the HoloLens itself is mainly focused on enterprise.” When we asked why such large organizations would choose to build something for a product that very few people own or know about, he said it was about projecting the right image. So is that all HoloLens is right now? Just an advertising gimmick? HoloLens leader Alex Kipman has publicly stated in the past that there’s no reason to talk about a consumer version of the device until Microsoft can get the price of the headset below $1,000. Of course, he didn’t say when that price drop would occur, and most developers we spoke to said it will likely require a new headset altogether. Rumors suggest a second version of HoloLens could be released as soon as 2019. Until that happens, it looks like Microsoft will remain squarely focused on bringing cheaper headsets to consumers this holiday season. The strategic shift—while somewhat heartbreaking to futurists—makes a whole lot of sense. All of the apps developed for Windows Mixed Reality for Windows 10 will technically work with HoloLens and Microsoft is making it especially easy for these developers to port over their apps. If Microsoft successfully gets people excited about cheap VR headsets on Windows computers, it could spark a surge of development for the platform, which, in the end, will help HoloLens. So it looks like our amazing Hololens future is still several years away, based on all accounts. We just hope that Minecraft is still popular by the time HoloLens is actually ready for everyday consumers.